Now that we have all made it to 2012, why not start it off right with some new year kitchen design tips under $200?! 1. Add Texture with Tile: To add architectural interest to any kitchen, carry the same tile used on the backsplash up onto the rest of the walls. Hardly a budget-buster, 12″ x 12″ sheets of penny round tile average just $10 per square foot. 2. Add Personality: A small backsplash can quickly be personalized by having a favorite photo printed onto commercial-grade billboard vinyl, which is easily wipeable and flame retardant. A standard 18″ x 6′ print will cost approximately $200 and even a small section will add a lot of visual impact. 3. Pendants with Panache: At its heart, the kitchen is a workspace making task lighting, like properly placed pendants, essential. Add style and illumination to your island or peninsula with unique pendants. Try vintage lanterns or depot lights, basket lights, hurricane pendants or even mini chandeliers. 4. Go Glitz with Lucite Knobs: One of the quickest updates is to change your cabinet hardware, but instead of the ubiquitous steel pulls, choose a fashion-forward option like Lucite knobs. Set them off by spray-painting a large-diameter washer chrome or a complementary color to create a decorative backplate. 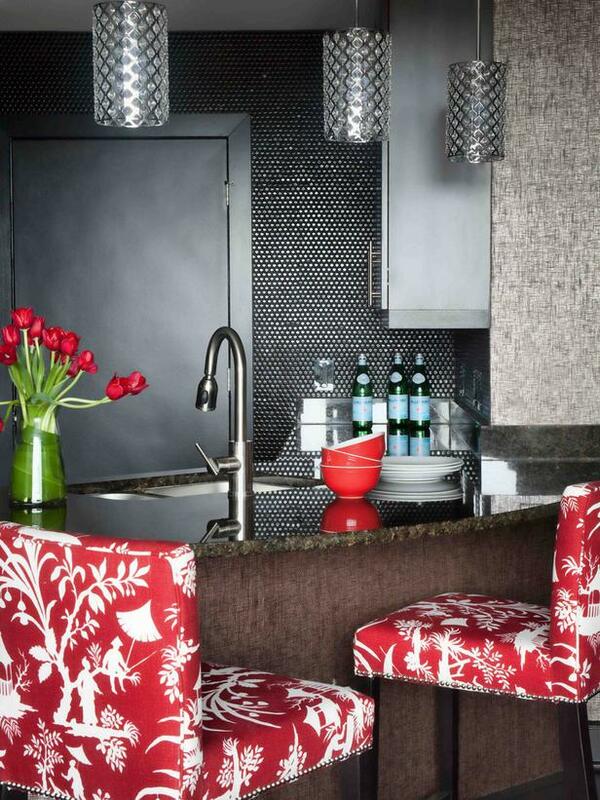 It creates a very glam effect and makes the cabinetry look more like furniture pieces.